The Portable Hercules II 750 Vertical Platform Lift has been designed to offer you the mobility options you need in your home or business. You get the same high-quality and durable construction as the Hercules II 750 model, but with a portability package that includes casters which allow you to move the lift from place to place. A constant-pressure rocker switch, an emergency stop and sensors that stop the lift if something is detected below it make it a safe option. 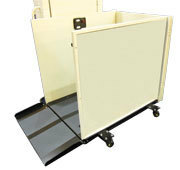 The sturdy 36" x 54" platform and 750-pound weight-limit make it ideal for almost all users in heavier power chairs and scooters. You can even use it outdoors thanks to the weatherproof controls. Contact us now for the details!